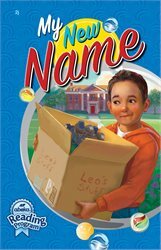 With vibrant marbles, mischievous kittens, and secret hiding places, follow Leo Hudson through a series of amusing encounters as he searches for the one thing he wants most – a forever family. While improving cumulative comprehension skills, this twelve-chapter novel will capture students’ hearts and teach them just how special they are to Christ. This book contains 12 chapters, and is the tenth (2j) and final book in the Abeka Reading Program for 2nd grade.